Speaking of which I don’t quite have my kitties here with me yet. Marla and Max will be joining me in South Texas as soon as I can get my act together and bring them home. My sweet Liddy and Gracie will have to stay with my parents who will make a great home for them. Apparently landlords aren’t crazy about renting to people with 2 dogs and 5 cats. Now 2 dogs and 3 cats, that’s totally cool but toss those extra 2 in and it’s a NO GO! 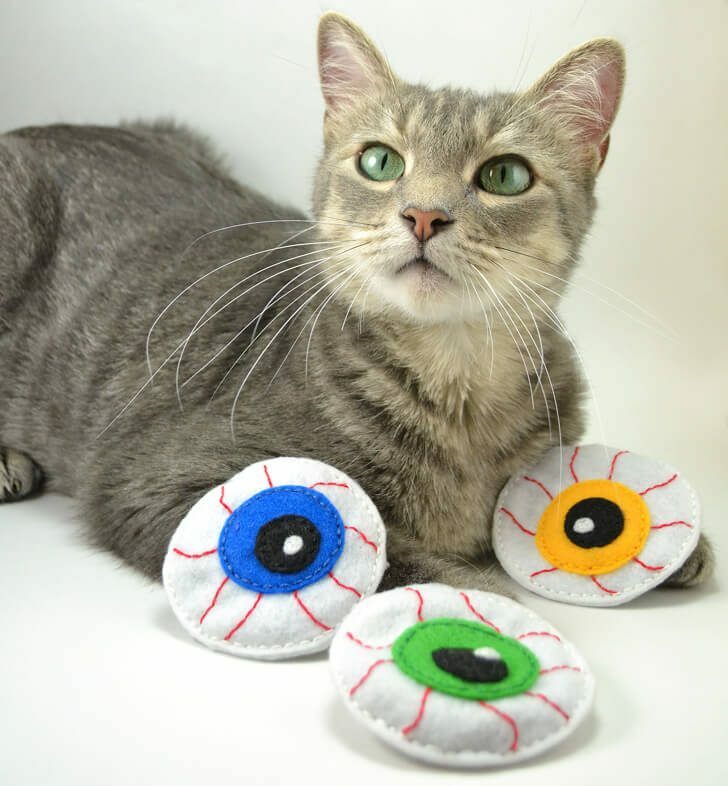 Every Halloween I find myself making little creepy toys for the kitties. We all seem to think seeing these macabre little things hanging out of their mouths as they stalk down the hall is quite cute. And since I won’t be seeing 2 of my favorite kitties in the whole world, I made a whole mess of eyeballs for them to play with in my absence. p.s. I’m not the weirdest person in the neighborhood (go me!) One of my neighbors opens the garage and puts a chair right in the middle of it and sits there and picks his nose. When he’s done he moves the chair back into the house and comes back out to shut the door. Every. Single. Day. 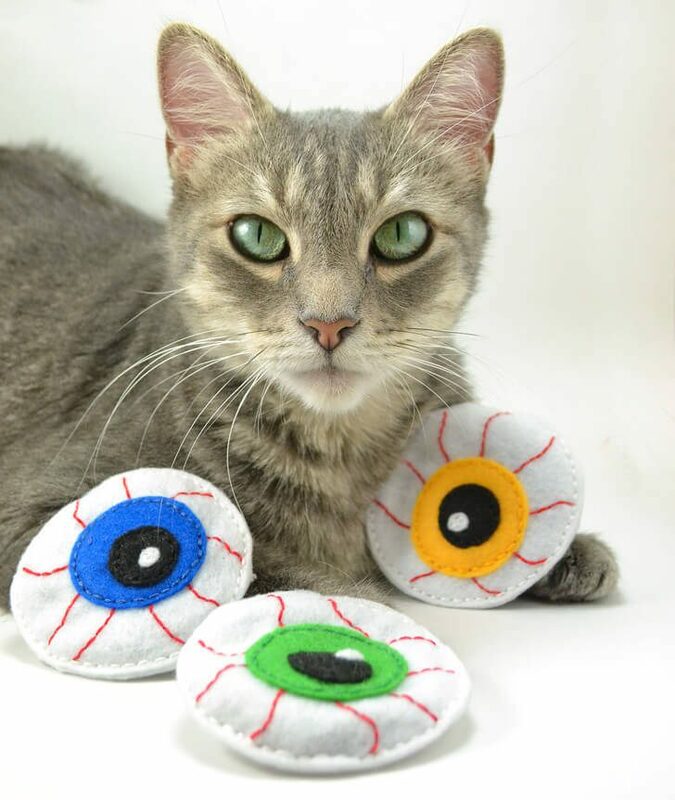 You’ll need a whole bunch of felt circles to rock out these little eyeballs. 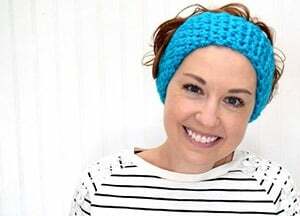 You can totally create them to your own size or you can print the image above. You can right click the image and save or print depending on your internet browser. I like to use freezer paper to make practically perfect felt cuts. 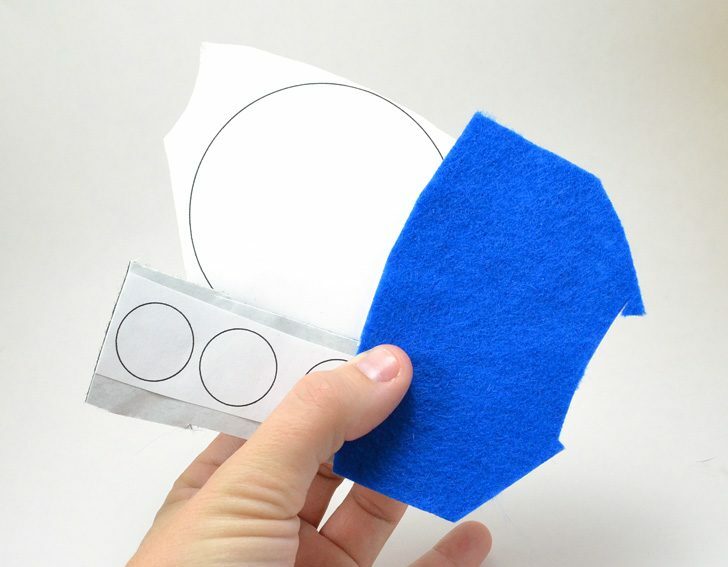 Want to learn how to perfectly cut acrylic felt <— I wrote a whole post about it! Your smallest circle will be white for the highlight on the eye. Your next will be black for your pupil. Then the a color like blue, or green or even yellow for the iris. 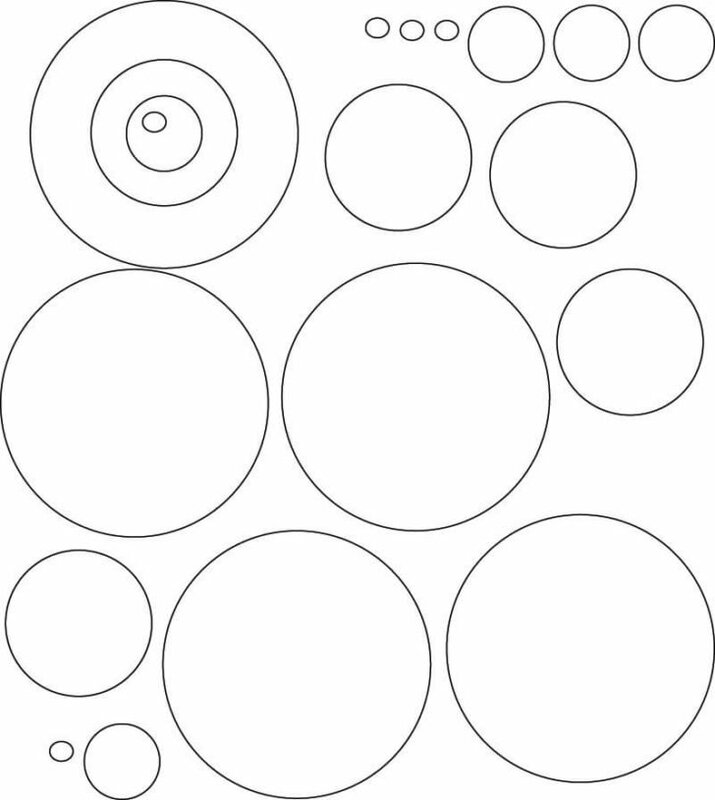 Your largest circle will be the white of the eyeball. 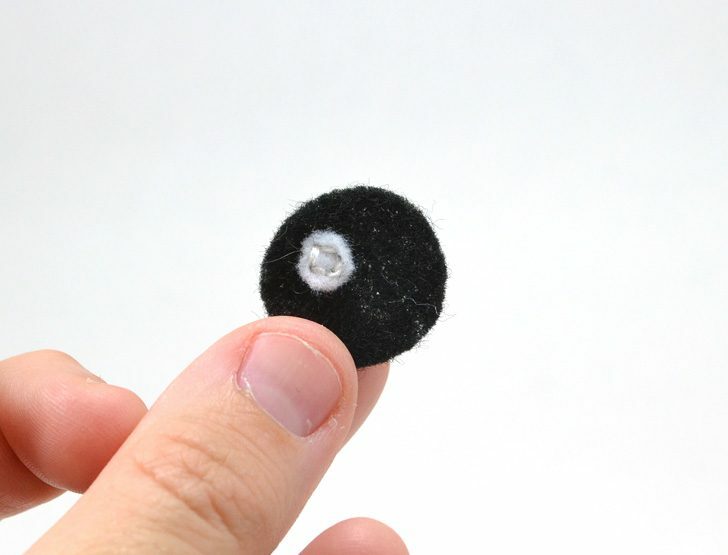 Sew your highlight onto your black pupil piece. 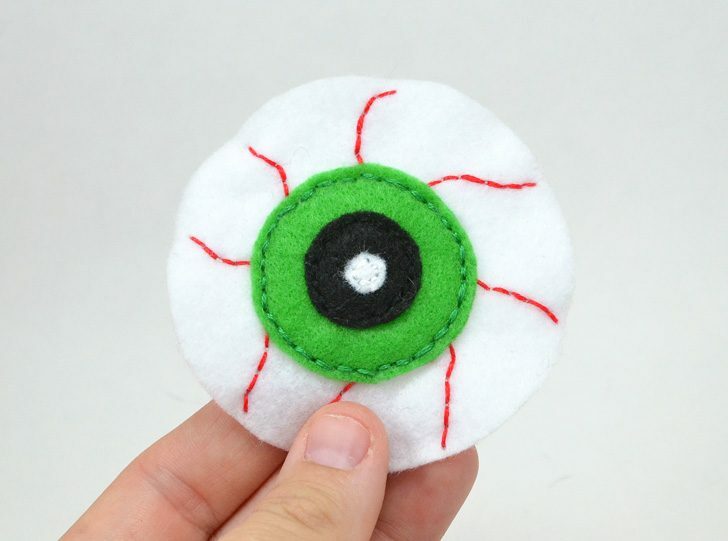 Attach that to your colored iris piece and then to your white eyeball piece. Using red embroidery floss, randomly stitch in curved lines to make this eye properly bloodshot. 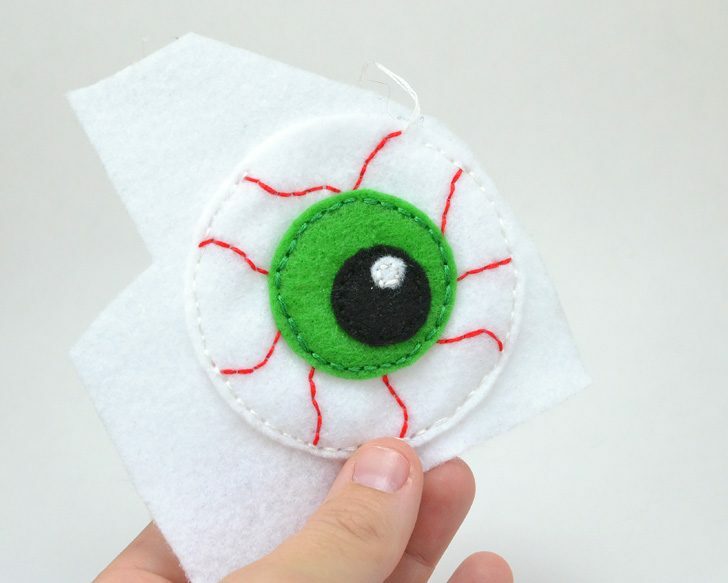 Grab a piece of white felt a bit larger than your eyeball and start stitching the eyeball onto it. Leave an open gap of at least an inch. 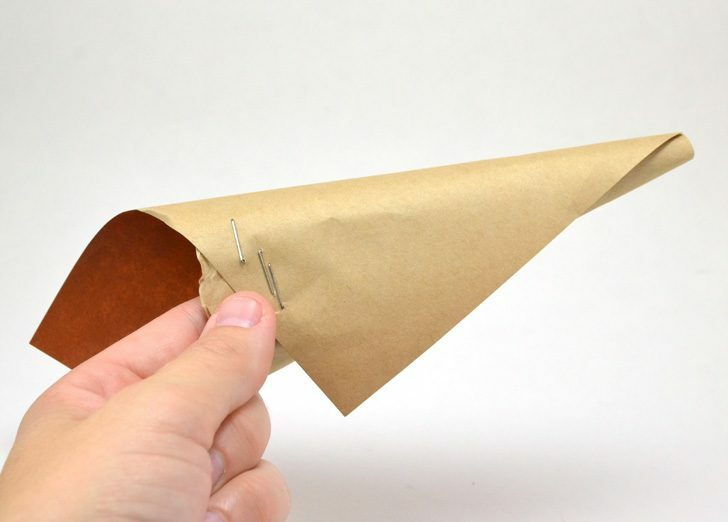 For less mess, make a funnel out of paper. 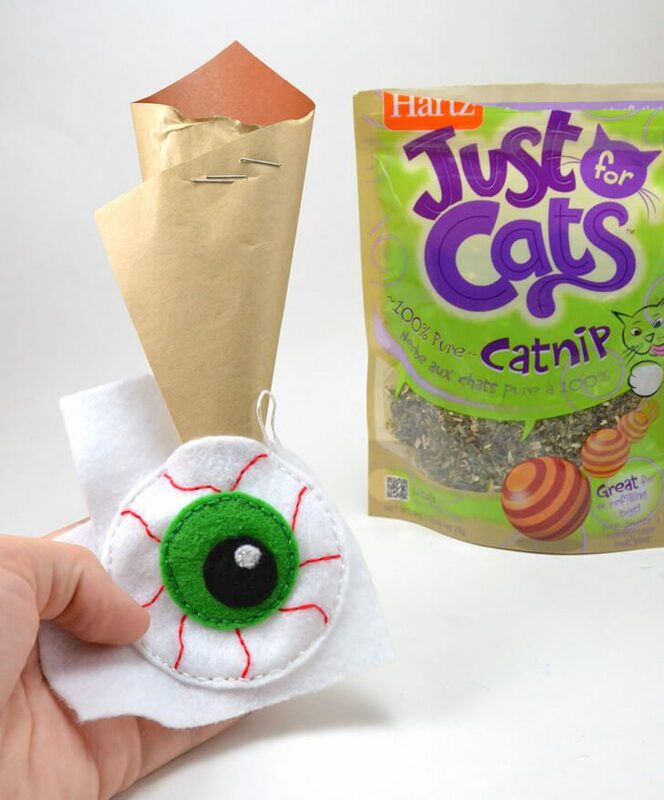 You can also use your fingers to push the catnip into the eye pouch but it is way messier. 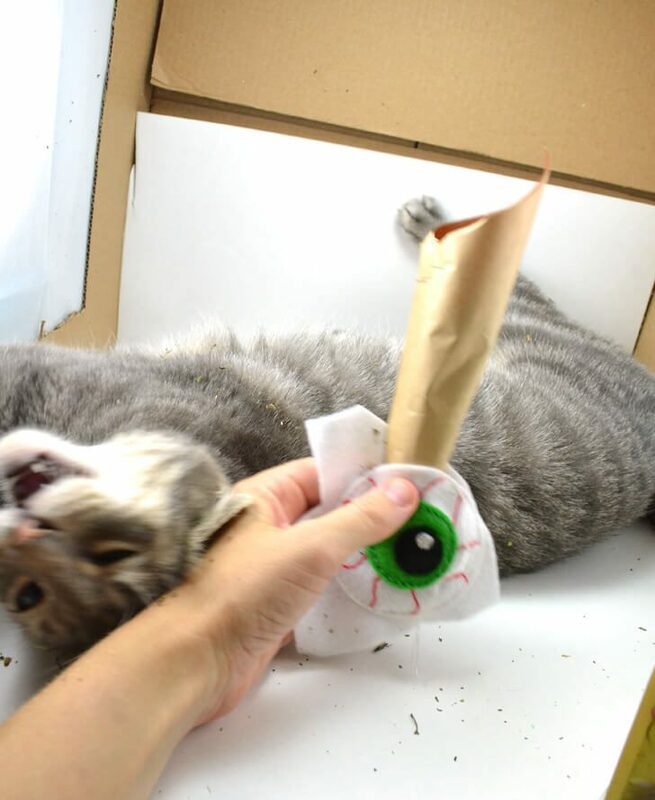 Pour catnip into the funnel and squish it back and forth so that the ‘nip falls out into the eye nice and neatly. It is so much easier if you keep the kitties away until after the toys have been made! Once filled finish stitching the the eye shut and the use scissors to follow the circular shape of the front white eyeball piece. Get the kitties involved and watch them start to ‘nip out! My Miss Marla is the sweetest kitty you’ve ever met. She loves every animal she comes across be it dog or cat and likes to cuddle at night. I often find her asleep in my arm pit or in the crook of my chin and neck when I sleep on my side :) The catnip only makes her even sweeter! For this project I used 5 pieces of felt at $.25 apiece and embroidery floss and catnip I already had. 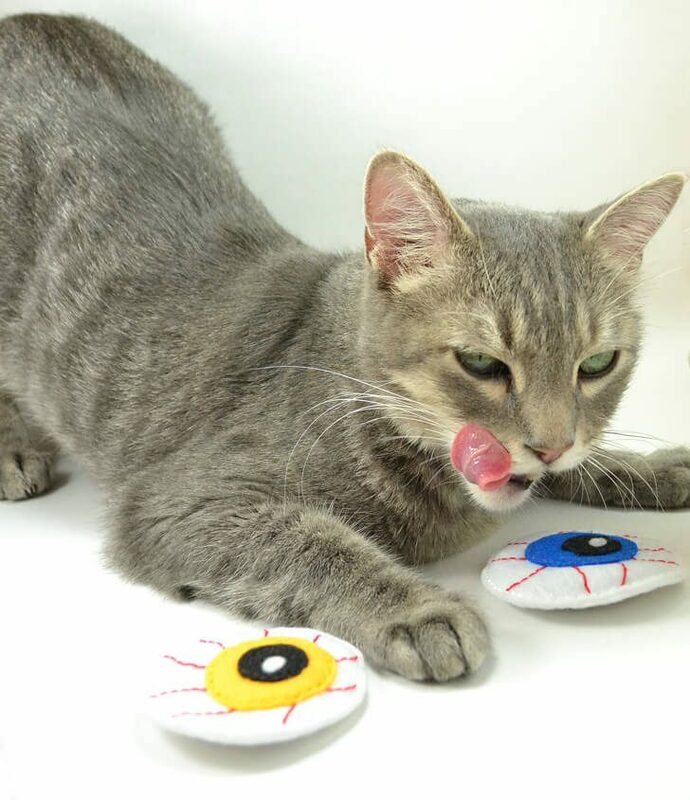 So for a buck twenty five each kitty got 2 of their very own eyeballs to roll around with! 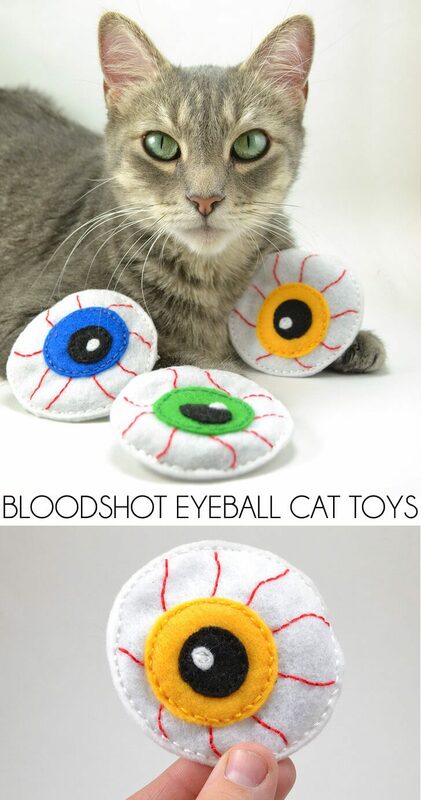 If you’ve never made homemade cat toys, I’d really recommend it. You’ll start to notice they’ll choose your handmade goodness out of the toy box over store-bought most of the time!